St. Martin-in-the-Fields was founded in 1890 in the home of Mr. Ira Doane on Franklin Avenue. The parish moved to its original site, a frame building on Perth Avenue, later that year. The church building was destroyed by fire in 1912, and soon after the parish moved to its present location. The “basement” church (now the parish hall) was begun in 1914. The upper church, with seating for 200, was dedicated on May 5, 1922. The dedication service celebrated many of the beautiful architectural features of the church, which you can see around the building. When you enter the main west doors of the church and look up, you’ll be able to see the war memorial window high in the west wall. The window, dedicated to the memory of those parishioners who gave their lives during the First World War, portrays the Crucifixion. The 11 stained glass windows in the nave feature angels holding banners that contain sayings of our Lord. They were given by the children of the Sunday School. The five smaller windows along the north aisle show symbols of the Passion of Christ. The sanctuary itself is decorated in hand-carved oak imported from Belgium during the 1920s. The reredos (the ornamental screen rising behind the altar) was given in memory of the Reverend S. De Koven Sweatman, rector from 1908 to 1919. The two-manual Casavant organ was first played by Dr. Healey Willan as part of the parish’s dedication festivities. 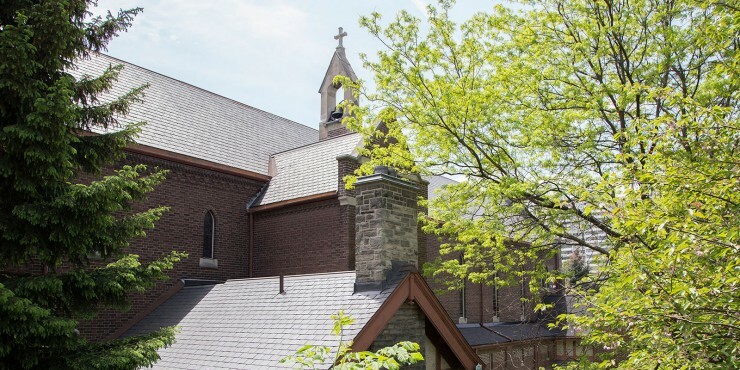 The church has undergone several renovations in order to meet the evolving needs of the parish and the community. In 2001, we decided to extend our space and improve accessibility. New interior stairs were added at the entrance and an elevator was installed to connect the upper and lower levels. New meeting rooms were added in the basement, with a green roof overhead. In 2015, we celebrated our 125th anniversary with many special events and guests. The corporation of the parish is made up of our rector, Fr. Philip and two church wardens, who are chosen at the time of the annual vestry meeting of the members of the parish. They are responsible for all matters related to running the parish and managing our parish finances. Our Rector’s Warden is Philip Savage and our People’s Warden is Cindy Paget. Management Board manages the property and finances of the parish, ensuring that we are good stewards of the heritage of gifts we have received. Parish Council coordinates the programs and events that enrich the life of the parish through Christian education, fellowship, stewardship, outreach and worship. An annual Stewardship campaign is organized every fall to coordinate financial givings and contributions of time and talent. These financial gifts, as well as volunteer hours and skills, enable St. Martin’s to offer the programs that make this parish so vibrant and relevant. Vestry is the yearly gathering of the parish to discuss various facets of our parish life and ministry. We deliver reports, including a financial report and budget, we elect officers to various positions, and we talk about our priorities and direction. The most important decisions in the life of the parish are made in this meeting.